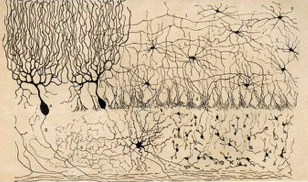 Neuronal diversity – what is it for? Neurons are biochemically, morphologically and electrically diverse. However, there is little consensus on what this prominent feature of the brain contributes to circuit function. In this inaugural annual meeting co-organised by NEUReka! 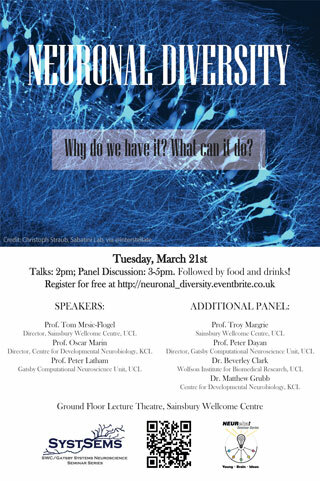 (the PhD student and Postdoc association of the Centre for Developmental Neurobiology) and SystSems (Sainsbury Wellcome Centre for Neural Circuits and Behaviour and Gatsby Computational Neuroscience Unit), we aim to foster discussion of the potential roles of neuronal diversity by bringing together experts in Developmental, Experimental and Computational Neuroscience to share their perspectives on this issue. This will be followed by audience discussion during which the audience can discuss the topic directly with our panel of experts. Time: 1400-17:00pm, Tuesday 21st of March 2017, followed by refreshments. Venue: Ground floor Lecture Theatre, Sainsbury Wellcome Centre, 25 Howland Street, London W1T 4JG.